Sage and Browned Butter Pita Chips – The perfect harmony of sage and browned butter come together with pita chips to take this snack to the next level. Ready in less than 20 minutes! Three days until Christmas?! Who’s ready?! I have one final gift coming tomorrow and then I’m all set. I know, this is last minute but I panicked when I saw all the gifts my husband got me. So one last minute gift was necessary. Sadly, today’s recipe isn’t necessarily festive. I just really wanted to share it with you guys! It’s a recipe for sage and browned butter pita chips. Homemade, I might add. But fret not, it’s easily one of the simplest recipe on this blog. But before we get into the recipe, can we talk about browned butter? It’s literally heaven. The smell alone is transcendent. It’s my new obsession. And when you add sage, forget about it. I will turn into putty right before your eyes. Browned butter is just that: butter that is heated past the melted stage until it gets golden brown. You’ve probably seen it in blondie recipes, cookie recipes, and even sauces. But I love it just by itself, with a little fresh sage. When you cook the sage in the butter, it gets super crispy like a potato chip. And yes, I’ll eat it just as such. The flavors combine to make an ultra rich, heavenly sauce. Mmmmm. This sudden obsession for this sauce started last month. I had a craving for this sage and browned butter sauce so I made it to serve with my chicken that night. I forgot how amazing the sauce was. It was that evening that I decided to incorporate that sauce into more of my cooking. But how? Around this time, I was eating tons of pita chips. We had so many leftover from a dinner party so I really had no choice. I’m not one to waste perfectly good snacks, that’s for sure. I was mid-pita chip binge when it hit me…these would be even better with a brushing of sage and browned butter! Eureka! 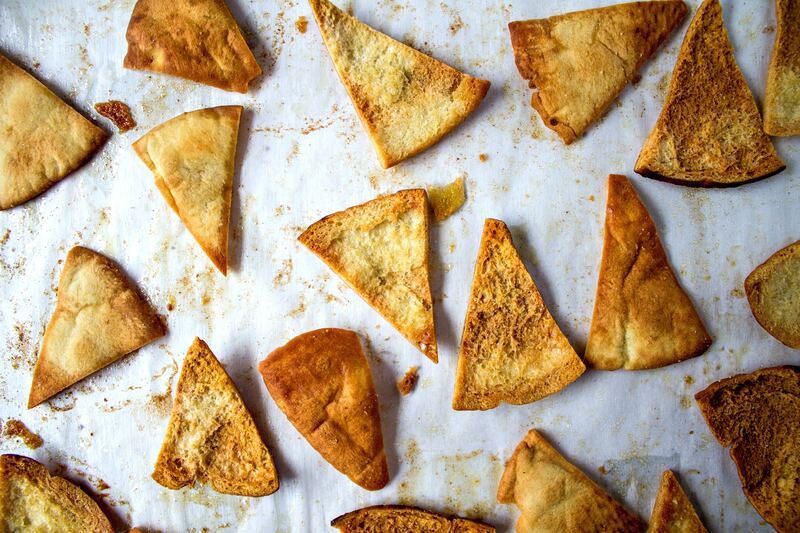 Pita chips are so simple to make. You just take pita pockets, cut into triangles, brush with olive oil, and sprinkle with salt before baking for 12 minutes. That’s it! You can add dried herbs and/or use flavored oils to give the chips more personality. For these chips, I eliminated 1/2 the olive oil, replaced it with browned butter, and added dried sage (also called rubbed sage). Dried sage will incorporate better than the fresh to ensure an even coating on the chips. This recipe uses pita pockets, not that thick pita bread you use in a gyro. If you use that thick bread, the pita won’t crisp up the same way. When making the browned butter, always keep your eyes on it. It will suddenly turn from golden to dark brown. You’ll know it’s ready when you can smell a rich butter scent. This is such a simple recipe and worth all the effort. I hope you love them as much as I do! Check out the full recipe below. The perfect harmony of sage and browned butter come together with pita chips to take this snack to the next level. Ready in less than 20 minutes! Grab small saucepan and set it on stove over medium heat. Place butter in pan. It will begin to melt and bubble. After 3 minutes, you will begin to smell a buttery aroma and see flecks of brown at the bottom. Once it gets golden brown, add the sage. Cook for 1 more minute. Remove from heat. Add in olive oil and stir to combine. Set aside to prepare pita bread. Preheat oven to 375 degrees. Now we will cut the pita pockets into triangles. First split the pita pocket in half. The best way to do this is to take a sharp knife and slice into edge of pita pocket about 1 inch. Continue slicing all around the edge and split open to release halves. Place pocket back together and cut pita in half. Place one half over the other and cut in half again. Repeat one more time so you get 16 triangles. Grab a sheet pan and cover with parchment paper. Brush parchment paper with olive oil and butter mixture until lightly coated. Place triangles on greased baking sheet in one even layer. Lightly brush each triangle with olive oil and butter mixture. Sprinkle with a little salt. Flip chips over and repeat on other side. Place baking sheet in preheated over for 6 minutes until lightly golden brown. These babies brown fast so keep and eye on them. Remove from oven and flip chips over to bake on the other side for 5-6 minutes. Do not let them get too brown! Remove from oven and let cool for a few minutes before eating. Serve with your favorite dip (my favorite is spinach artichoke) or eat all by themselves! MMmmm brown butter with sage on chicken sounds heavenly!! I definitely need to give that a try someday. And these pita chips look awesome! I love how easy they are to make. Thanks for the recipe. I’m hosting a bite-size foodie game night and could use this. These look so good and way better than the store bought kind. Thanks. OMG this sounds so amazing! can’t wait to make it! These look delish! I love pita chips! These look fab I’m definitely trying these out. Thank you so much for sharing. These look fantastic. I’ve never actually made my own pita chips before. You make it look manageable! I love pita chips! These look so delicious!! Oh, my God! These look so crunchy and yummy! I’m starving. I love pita chips! These sound so good! I love this recipe idea. Sounds so good. This is a really great and yummy looking idea! Thank you for the recipe! This looks so good! Love this! And so much healthier than getting them at the store with 25 ingredients and preservatives! Now..can we put the chips aside and talk about that dip?? Please? Haha! That dip is actually store-bought! Eek! But it’s my absolute favorite. It’s spinach artichoke dip from my local grocery store – Publix. Brown butter is such a wonderful way to bring out more of the flavors. Just learning to love making brown butter. I enjoy making our own chips and will be adding these to the recipe box. Love pita bread, never heard of this recipe so will defiantly be giving a tryout. I love pita chips but have never made them at home. These sound delicious especially with the sage and browned butter! These look yummy.I might even be able to make them!